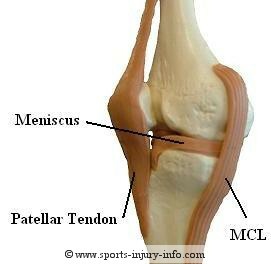 MCL injury is a common sports injury, especially with contact or collision sports like soccer and football. The medial collateral ligament, or MCL is a primary staiblizing ligament of the knee, and its injury can be painful and debilitating. How bad is it? Time loss from an MCL injury can range from a couple weeks, to several months depending on its severity. While not as dreaded as an ACL knee injury, it is still significant and must be treated appropriately. 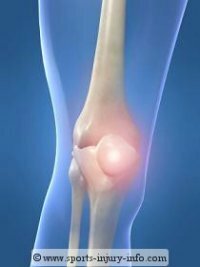 Lets take a closer look at the medial collateral ligament and this type of knee injury. The medial collateral ligament is a band of connective tissue that runs between the femur and the tibia. It is located on the medial, or inside part of the knee, and crosses the tibio-femoral joint. As a ligament, it helps to restrict excessive joint motions. The MCL blends in with the knee joint capsule along the medial side, and portions of this ligament are found both inside and outside of the knee joint. It is also sometimes called the tibial collateral ligament. The most common mechanism for MCL injury is some type of hit or blow to the outside of the knee. Take for instance in football, a running back being tackled at the knee from the lateral side of the body. As the knee is hit from the outside, it causes the knee to buckle towards the inside, and the MCL is stretched or torn. Another way to injure the MCL is to have a pivot shift type of mechanism. Pivot shift is a common mechanism for ACL injury as well, and involves planting the foot, and then changing directions quickly. As the body does this, the knee pivots and shifts over the planted foot, and twists into a position that causes damage to the ligaments and possibly to the meniscus. MCL injury is also part of the "Unhappy Triad", or the common injury of the MCL, ACL, and Meniscus all together, usually through a pivot shift type of mechanism. The most obvious sypmtom of MCL injury is pain. Following the injury, you will experience pain in the knee, usually along the iside of the joint. It will be tender to the touch, and may hurt more when you fully strighten or fully bend the knee. Pain is usually moderate in nature, and is sharp. Swelling is common with MCL injury, and is usually located over the inside of the knee, directly over the position of the MCL. There may be some swelling inside of the knee joint, but this is not always true. You can feel the swelling when you touch your knee, and it feels puffy or "full" to the touch. Discoloration may also occur over time, as the bleeding from the injury makes its way to the surface of the skin. Decreased range of motion, decreased strength, and decreased function are all signs of an MCL injury as well. Within the first 24 hours, it is best to treat an MCL injury with R.I.C.E. or rest, ice, compression, and elevation. Also, depending on how much pain you are having, the use of crutches and limiting time on your feet is also a good idea. If you have pain, swelling, loss of range of motion, or any other questionable symptoms in your knee, you need to see your physician. Medial collateral ligament injuries do heal well with time, and very rarely require surgical intervention. That is the good news. The bad news is that in order to get the best healing possible, the knee needs to be immobilized or at least restricted to a safe range of motion. Since the MCL becomes most taught at full extension and flexion, I generally recommend putting athletes with MCL injury into a hinged knee brace that does not allow full extenion or full flexion for the first 2-3 weeks. I usually set the brace at 30 degrees extension, and 90 degrees flexion. Different doctors and athletic trainers will set their braces at different angles, depending on their own philosophies and beliefs. The important thing during the initial treatment is to limit painful motion. In the first 3 weeks, don't bend or extend your knee to the point where it hurts. 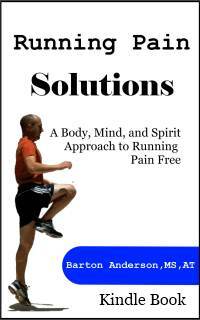 The pain is an indication that you are placing stress on the healing tissues. The more stress on the tissues, the more they will be stretched out as they heal. This leads to more laxity, or looseness, in the joint and will result in more problems in the future. After the first 3 weeks, it is a good idea to begin rehabilitation to work on regaining your strength, endurance, range of motion, proprioception, balance, and function. Every athlete wants to know, bottom line, how long they will be on the sidelines after an injury. With MCL injury, the time frame for recovery generally ranges from 3-8 weeks, depending on the severity of the injury, the amount of rehabilitation, and the age and activity level of the athlete. Minor sprains will return faster than second and third degree sprains, which have to me immobilized for longer periods of time. MCL injury is a common sports injury, especially with contact sports. It rarely requires surgical intervention, but does need to be treated appropriately, initially with R.I.C.E. and immobilization, and then with rehabilitation to restore normal muscle and joint function. Most MCL injuries will heal in 3-8 weeks, and you can be back on the field and off the sidelines.